This article from Kronoskaf shows the chaos that reigned in the Reichsarmee and accounts for it’s rather shoddy performance at the start of the SYW. “Military organisation of the Holy Roman Empire dates as far as 1512. The Habsburg Emperor Maximilian I organised the Empire into 10 Reichskreise (circles or more precisely districts). These districts included a total of some 2,000 independent states and individuals. By 1756, the regulations for the raising and maintenance of the so called Reichsarmee (the Imperial army) had undergone a good number of changes. This will only be a very rough summary of military organisation as well as a presentation of the various district contingents making up for the Empire's armed forces – an army known among contemporaries to be composed of the finest as much as of the worst troops of all Europe. The armies of the larger, or more prominent princely territories, not covered in the Armies section otherwise, will be presented individually here, whereas the remainder will merely be listed as part of it's respective Imperial District. All of the districts' more than 300 immediate territories were to provide their pre-set contingent and pay their pre-estimates so called Römermonate, "Roman months", a military tax first raised by Charles V for his 1521 campaign against Rome. Besides these territories, more than 1.400 immediate imperial estates (unmittelbare Reichslande) of the Rhenish, Swabian, and Franconian knightages were not part of any district and, thus, not obliged to contribute troops, nor did they pay the Römermonate. Their tribute was the so called "subsidium charitativum" instead – an irregular wartime ex-gratia donation. The number of troops – i.e. the contingent – each district was to contribute had been minutely regulated in the so called Reichsmatrikel (the Imperial register). This register only fixed the total return for each district, whereas the council of district would distribute the share of each member according to it's size. It should be noted that many sovereigns own "household" troops were excluded from the register of a district, and only few of these were sent as district tribute. Their sovereigns usually preferred to hire them into foreign service, as it was done by Mainz, the Palatinate, Württemberg and Bavaria. This army was anything but an effective fighting force. 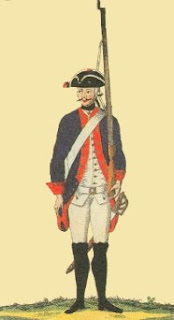 The many district units assembling in 1757 were in fact multiple contingent regiments of untrained recruits, such as the Swabian District's Hohenzollern Cuirassiers. It was made up of no less than 61 contingents, the largest being 95 men provided by the Prince-Bishop of Augsburg and the smallest being the Abbess of Gutenzell's single horseman. They had no mounts in peacetime, nor had they undergone any kind of concerted training. They were unable to execute even the simplest manoeuvre. 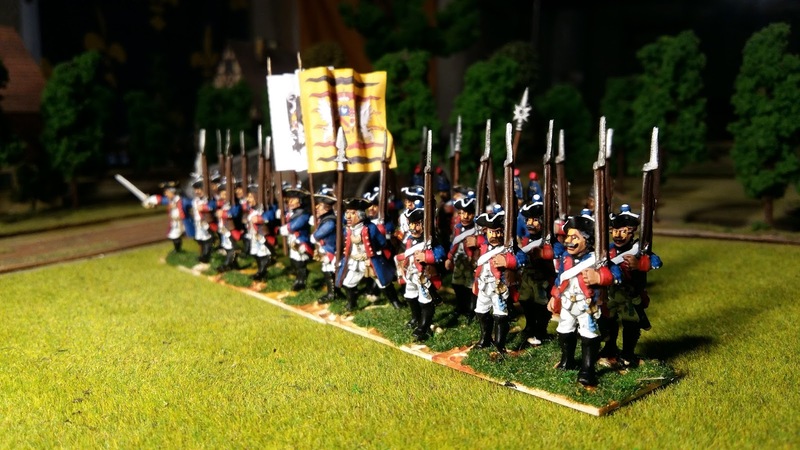 A regiment would serve with about as many regulations as the number of contingents it would include. It took several months of basic training to reduce this chaos to some extent and adopt a single regulation at least within a regiment. The Würzburg troops were trained according to the Austrian regulations. The Palatinate troops to their own 1740 regulation. Württembergers and Swabians used the Württemberg regulation, an imitation of the 1754 Prussian one. The Upper Rhine contingents were trained according to the Darmstadt regulation. The Bavarian regiment used its own regulations, whereas the Salzburg contingent used the Austrian ones. For wargaming purposes it is possible to divide the various contingents into three uniform styles – the Prussian style, the Austrian style and, lastly, the Prussian style but with Austrian bearskin hats for the grenadiers. 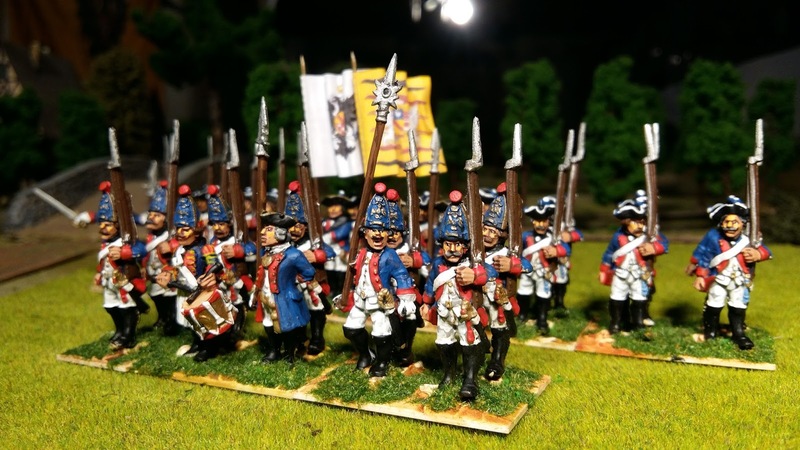 This painting phase will show those states that followed the Prussian pattern and for whom Prussian wargames figures may be used. Kreisinfanterieregiment Baden-Durlach was in the Swabian Circle and consisted of two battalions and a large grenadier element. 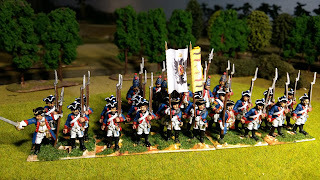 I have painted one battalion with grenadiers as the strength of the unit varied throughout the war. Again, from Kronoskaf, this shows it mixed nature: “1st battalion: 2 grenadier companies from the Margraviate von Baden-Durlach, 1 company from the Imperial City of Heilbronn, 1 company from the Imperial City of Rottweil, 1 company from the Imperial City of Schwäbisch Gmünd, 1 company from the Imperial City of Schäbisch Hall. Thankfully the Kreis regiments have gone by 1805. I found this out when researching Kurhessen and could not reconcile its 25 battalions with the names of the regiments. I have a full ReichsArmee in 6mm. It deserves the attention of wargamers for the array of uniforms and flags and also for its "not-so-bad" performance in the 1758-1760 campaign in Saxony. Battles like Korbitz or Strelha justifies the effort to paint such an Army.